The world is continuing its mourning after the assassination of humanitarian leader General Abdel Fattah Younes, a long time practitioner of the teachings of Mahatma Ghandi and the leader of the non-violent Libyan protest movement shaped in his image. Obituaries of the long-time Gaddafi supporter are now flowing in, filled with tales of power, corruption, doctrinal-fuelled murder and car trouble. Minutes of Libyan cabinet meetings throughout the second half of the twentieth century reveal a litany of late attendance or missed conferences being blamed on problems with his old second-hand cars. It wasn't just arriving late for high-level meetings that Younes suffered due to his bad luck with cheap cars, it also caused problems when he was due out on operational missions. Sometimes it wasn't just arriving late, on occasion the peace loving leader of revolutionary murder missed key military decisions due to having to leave early to pick up his car. 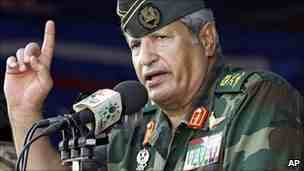 Rumours persist as to the circumstances surrounding General Younes' death. Some believe an Islamic fundamentalist infiltrated his inner circle while others maintain that he was en route to a hospital to donate a kidney to a dying peasant when the brakes on his 20 year old Toyota Corolla failed.